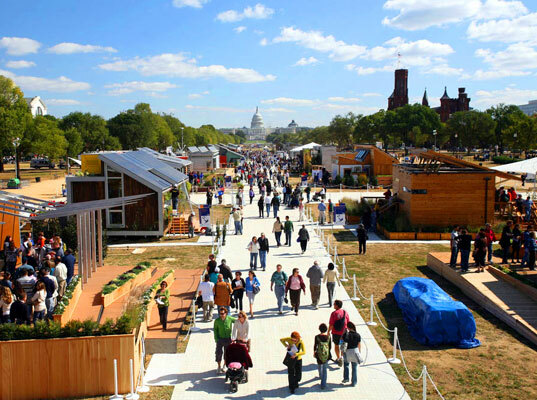 Alliance for Green Heat, January 16, 2013 - A wood stove design competition to be held on the National Mall in DC this November is pitting 16th century designs against microchip-controlled automation. And it is not clear who will win. For most Americans, clean renewable energy conjures up images of solar panels and wind turbines – not wood stoves and furnaces. But that could change. “This competition may produce technology so consistently clean that wood can become a top tier renewable like solar,” Ackerly said, whose organization is hosting the competition. Eight of the 32 entries are innovations on masonry heaters, a technology developed in the 16th century when wood prices soared in Europe. These heaters are known for their ability to efficiently store and radiate heat for hours after the initial fire goes out. However, they tend to be expensive and may lose points in the affordability category. Five of the stoves are automated, using oxygen sensors and thermostats to control some or all of the combustion. Some make their own electricity while others require it to operate their automatic controls. Some can recharge cell phones and be operated by smart phones. Three of the stoves are technically boilers which send water to heat other rooms in the house, but look like regular living room wood stoves. Seven of the stoves are downdraft designs, meaning the flames are sucked down during the combustion process, which can result in extremely low emissions. Other designs don’t easily fit into any single category because they include several innovative features or are just very unique. Eight of the stoves are already in stores, vying for recognition and market share. With a few exceptions, most teams come from North America and Europe, where the race to deploy renewable energy heating equipment is building momentum. Later this month, nine judges representing universities, institutions and government agencies will narrow down the 32 entries into 12-16 finalists that will be rigorously tested by trained stove technicians until an overall winner is chosen. Funding for the competition comes from government agencies, foundations and sponsors. “The history of wood heating is not always a linear progression towards cleaner and more efficient designs,” said Ackerly, who created the competition with college friend Jim Meigs, now Editor-in-Chief of Popular Mechanics. “The pellet stove, invented in the U.S. in 1973, was a great leap in the history of cleaner wood heating. A similar leap is needed with cord wood, and when the right technology meets the right price, we could see a renaissance in wood heating,” Ackerly said. Does the EPA Test Method Hinder Stove Innovation?